Peter Spanton (8th dan) is one of Britain’s first generation of karate black belts, gaining his first dan in 1966 under Tatsuo Suzuki (then a 6th dan) in the All-Britain Karatedo Association’s Honbu in Clapham, SE London. 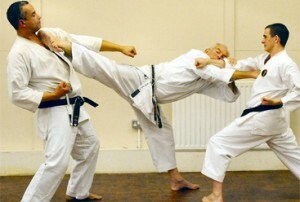 Even as a novice, Peter was always an effective karateka – as the resident Japanese instructors at that time will confirm. The ABKA’s Secretary, Len Palmer, confided that Mr. Suzuki grew so annoyed at Peter’s fighting skills that he sent for the All-Japan champion, Hisaomi Fujii, to come to Britain and sort him out! Though Peter got the worst of their encounter, he stood up well and gave a good account of himself. When the Japanese left the ABKA, the mantle of technical development fell on the heads of Peter and his contemporaries. They were so effective that the re-named BKA grew to become the largest and most successful organisation in membership of the British governing body. Peter represented his country at a number of early internationals and fought with great distinction, becoming England’s first international medal winner. Later he became a world-respected kata and kumite judge for the then WUKO and its continental member, the European Karate Union. Peter was once criticised by one of his countrymen for being ‘a little too impartial’. As referees, we should all have this fault. When Peter took his world kata-refereeing examination under a panel of Japanese 8th dans from different styles, they told him that he ought to be representing his country in kata – not judging it.